Convenient – Dries out all kinds of boots, shoes and wellingtons giving you warm dry footwear to put on the next morning after a wet day out. 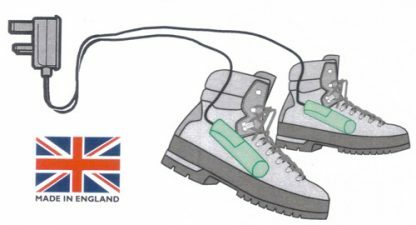 Simple – Just place a cylinder in each boot or shoe, plug into the mains, switch on and you will have comfortable dry footwear in a matter of hours or overnight. Each set contains drying cylinders for two boots or shoes connected to the mains with a single plug. Safe – All electrical components used are to BSI standard specifications. Design approved for safety by Gemitz. Patent applied for. The cylinders do not function by direct heat, but by warming the air around them inside the boots or shoes. Kind to the boots and shoes – uncontrolled heat from boilers, radiators and fires can lead to deterioration and cracking. Cheap to run – 30p for 100 hours approx.